American Wolf: Last Thoughts On Fats Domino, 1928-2017. Last Thoughts On Fats Domino, 1928-2017. Earlier today it was announced that Antoine Domino Jr., forever known by his stage name "Fats" Domino, passed away at the age of 89. Although Fats Domino has been frustratingly overlooked in recent years, he is not only one of the true founders of rock & roll, but arguably the first major rock star to record the music. Domino made his first record, "The Fat Man," all the way back in 1949; for comparison, at that time Little Richard was paying his dues in Buster Brown's Orchestra, Bill Haley was a yodeling cowboy with The Saddlemen; Chuck Berry was studying to become a beautician, & Elvis Presley was still the biggest loser in his high school. "The Fat Man" was co-written by legendary New Orleans producer/performer/songwriter/A&R man Dave Bartholomew (who, by the way, is still alive at the age of 98), & was essentially a cleaned-up version of "Junker's Blues," a dope song credited to Willie "Drive'em Down" Hall; as some like to tell it, Domino's song was the first rock & roll record of them all. If it was, then rock & roll came out of mud. Opening with a rolling, driving boogie that would power Domino for over a half-century of music-making, "The Fat Man" has an earthy, raw feel that would set the stage for the finest rock music from Elvis's Sun recordings to The Kinsmen's "Louie, Louie" through The Rolling Stones' Exile On Main St. & Kurt Cobain's home demos. New Orleans musicians alone couldn't get enough of it. Professor Longhair turned it into his own masterpiece, "Tipitina," while Lloyd Price reworked it as his own first hit, "Lawdy Miss Clawdy." Domino followed "The Fat Man" with over a decade of hits that made him the best-selling '50s rocker after Elvis. He broke through to the mainstream (read: "white" audience) in mid-1955, with his song "Ain't That A Shame," which, covered by Pat Boone, was one of the earliest examples of a white singer stealing a song from a black artist, as Boone took it all the way to #1. Enough kids were interested enough to seek out the original though, giving Domino his first Top 10 hit. Next to the wild likes of the duckwalking Chuck Berry or the riotous Little Richard, the easy-going charm & warm delivery of Domino seemed to provide an safe first step for a white audience curious about this new black music. At a time when the few blacks on pop radio sang sweet ballads or novelties, "Ain't That A Shame" landed with the sonic impact of a piano falling from the sky, as, decades before today's gangsta rappers were born, Domino shouted out ghetto-accented staccato accusations about sad separations ringing like cannonades across a country divided by segregation--"You made . . . BOOM! BOOM! . . . me cry . . . when you said . . . BOOM! BOOM! . . . goodbye . . ."
From there until early the next decade, Fats Domino did not stop. His hits are some of the biggest records of the day--"I'm Walkin'," "I'm In Love Again," "My Blue Heaven," "Blue Monday," "Whole Lotta Loving," "I'm Ready," "Walking To New Orleans," & the song with which he's most associated, "Blueberry Hill"--& made him the most reliable African-American hitmaker of rock. Along the way, he shaped the music like few others. Buddy Holly covered his "Valley Of Tears" on his first LP; Ricky Nelson helped to make rock safe for white folks when he sang "I'm Walkin'" on The Adventures Of Ozzie & Harriet; Domino himself appears in perhaps the finest of the sanitized '50s rock films, The Girl Can't Help It, alongside headliner Little Richard (& Eddie Cochran, Gene Vincent, & The Platters); when Elvis Presley, Jerry Lee Lewis, Carl Perkins, & Johnny Cash gathered for the fabled "Million Dollar Quartet" session, one of the few songs noted in the local newspaper that they sung was Domino's "Blueberry Hill" (although sadly no audio exists of this song); Ernest Evans came up with his own version of Domino's name & reinvented himself as Chubby Checker to score one of the biggest hits in rock history with "The Twist"; Ronnie Hawkins & The Hawks cut their teeth on his records before The Hawks went on to back Bob Dylan (& even later become The Band--they would cover his "I'm Ready" on their Moondog Matinee LP); The Beatles' recorded "Lady Madonna" in tribute to Domino (his cover in turn would be the final Top 100 hit of his lifetime); John Lennon covered "Ain't That A Shame" on his 1975 Rock 'N' Roll LP; Randy Newman & Dr. John both made entire careers out of emulating Domino's left hand, albeit in drastically different ways; when Chuck Berry began playing smaller gigs in the late '90s in his native St. Louis, it was in a club called Blueberry Hill. & way back in 1957, the finest rock singer of them all, Elvis Presley, once told the press, "Let's face it: I can't sing it like Fats Domino can. I know that." A dozen years later, Domino came to Elvis's first concert at the Las Vegas Hilton. When a journalist referred to Elvis afterwards as "The King," Presley reportedly gestured to Domino & said, "No--that's the real king of rock & roll." & unlike Presley, Fats Domino lived to see the fruits of his efforts. In 1986, Domino was one of the original ten inductees into the Rock & Roll Hall Of Fame, alongside Chuck Berry, James Brown, Ray Charles, Sam Cooke, The Everly Brothers, Buddy Holly, Jerry Lee Lewis, Little Richard, & Elvis Presley. (The only ones left now after today are Don Everly, Little Richard, & Jerry Lee Lewis.) The following year Domino won The Lifetime Achievement Award at the Grammys--the first rock artist to win the award after Elvis Presley & Chuck Berry. & in 1998, President Bill Clinton presented Domino with a National Medal Of The Arts. That medal was lost with nearly all of Domino's worldly possessions after Hurricane Katrina in 2005. Like many of his Ninth Ward neighbors, Domino stayed put to try & weather out the storm (& care for his ill wife Josephine who he married in 1947; she later passed away in 2008); Domino was eventually rescued & taken to a shelter in Baton Rogue. When he returned home & President George W. Bush came by to give him a new National Medal Of The Arts, it was the last time he registered in the national consciousness. Domino moved out of the Ninth Ward to a suburb of New Orleans where he lived out the remainder of his life. For a music that has gotten so much from Fats Domino, he seems to stand counter to its core characteristics. Humble, soft-spoken, & full of positive vibes in a music that is too often brash, loud, & cynical, Domino might strike modern listeners as remote, if not quaint. If so, then they are not listening very closely. 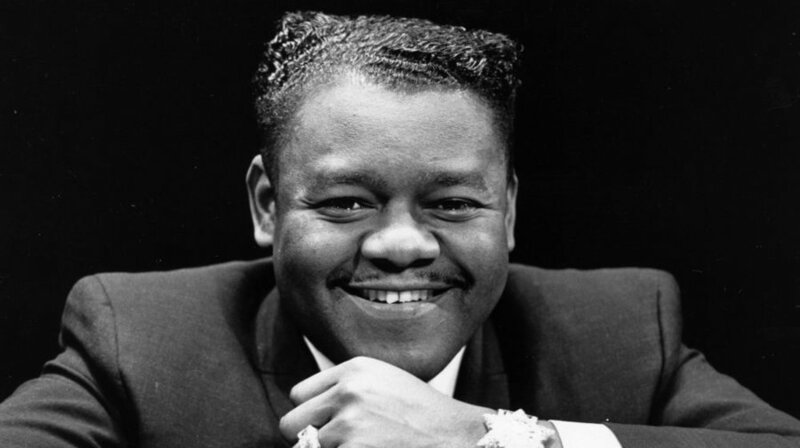 Fats Domino can rock with the best of them, & his finest records--"Ain't That A Shame," "My Blue Heaven," "Blue Monday," "Blueberry Hill," & his very first hit "The Fat Man"--can rock as hard & well as anyone else's. His music rolls through rock like the waters of his native New Orleans, a bedrock that is always changing, always the same. As the backup singers of his 1961 hit "What A Party" call out, "Big fat piano man, he sure could play!" Last Thoughts On Tom Petty, 1950-2017.